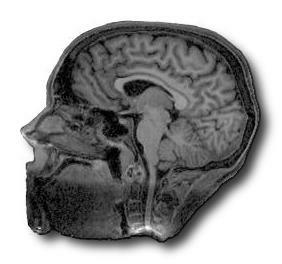 This is a structural MRI picture of my brain taken at the Wellcome Department of Imaging Neuroscience, UCL (“the FIL”) on 2004-08-18. Notice all the empty space! I edited the image here to appear nicely on a white background. More images here or as a PDF. Thanks to Angela Yu for the scan and providing the images.